Retail $65.88 SAVE 20% ! 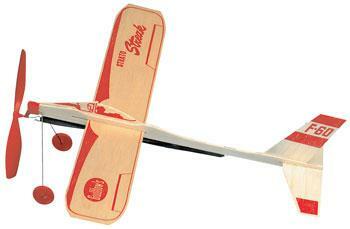 "Gliders for junior high summer camp"
Easy to build and fun to fly for students, but also easy to break. Be sure you read the instructions and wind the propeller in the correct direction. King size motorplane that, fully wound, takes off from the groun under its own power for a long extended flight. Formed landing gear plus a plastic propeller and nose bearing. Instruction on back of package. Easy to fly and assemble! When fully wound, it takes off from the ground under its own power for a long extended flight. Landing gear with red plastic wheels. Canopy, wing, rudder and elevator are pre-decorated with red print and graphics.